This weekend was the Foodbuzz Festival and I had the best time! I made new friends, met some great people and I ate and ate. The event was held in San Francisco and as much as I love the city I am so happy to be home. You couldn’t even imagine how much I ate. It was mostly samplings, but their were so many that I over did it! And I mean over did it! When I came home the first thing I was craving was a hearty home cooked meal. Not a piece of this and a piece of that. So I decided to make my Husband’s homemade chili. 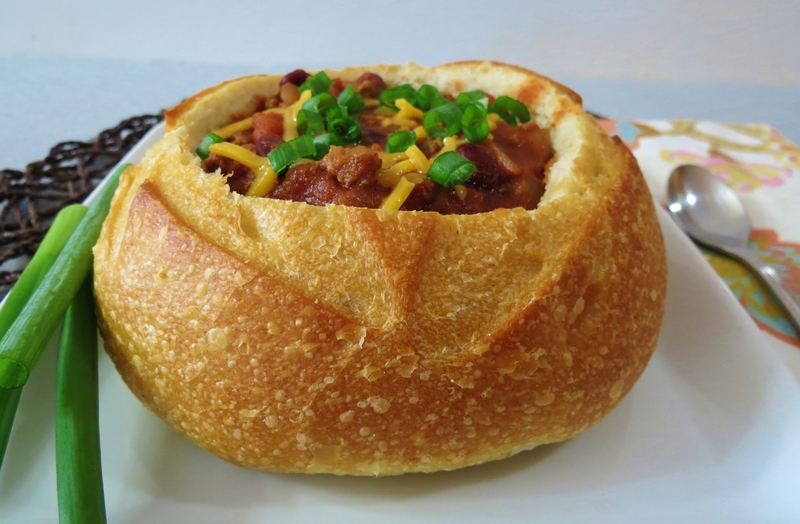 When I was in SF I wanted to go down to the wharf and get some chili in a sourdough bread bowl, but I never got the chance so I decided to serve the Chili in a sourdough bread bowl. The chili tastes amazing! It’s thick and hearty and perfect for a chilly Fall evening! It is the perfect comfort food. I made Wally’s Beef Chili with ground beef, canned tomatoes, tomato sauce, kidney beans, a pinch of sugar, chili powder and onion. 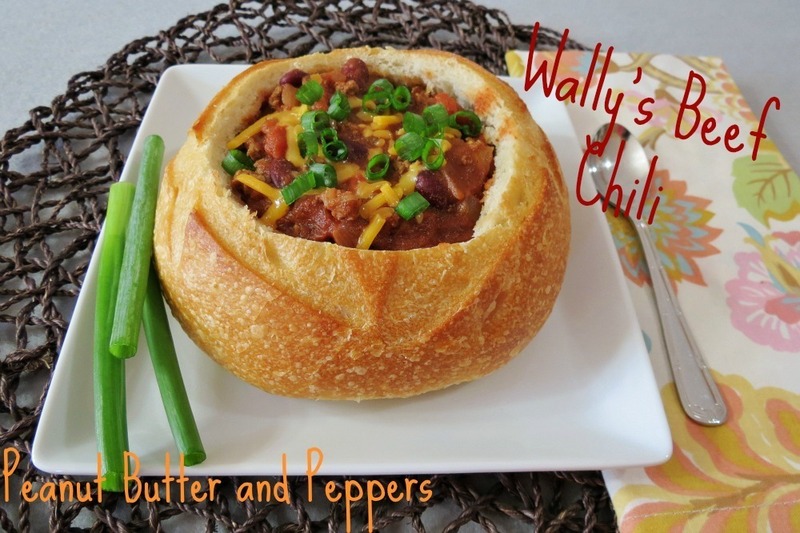 I served the chili in a sourdough bowl, topped with sharp cheddar cheese and diced scallions. This was exactly what I was craving in SF. In my opinion I think my Husbands Chili is way better than any restaurant! After being in the city this weekend, I realized how much I miss it. I live so close to it, but I never go there! I am now going to make it a point to go at least once a month, if only to go to the Farmers Market, but I’ll talk more about that later this week. After I post my Husband recipe, I’ll give you more of a recap of the weekend, and there is so much to tell!! A hearty chili chock full of ground beef tomatoes and seasonings. In a large pot add onion and ground beef. Cook until the beef is no longer pink. Drain the fat. Add tomatoes, chili's, tomato sauce, sugar, kidney beans and chili powder. Mix until combined. Cook over low heat for approx 60 minutes; stirring occasionally. I thought I would share with you the first day of my Daily/FoodBuzz event. I went to the event with Marlene from Nosh my Way. I met Marlene through Foodbuzz’s Facebook page, which was just so cool. I never met and actually made a friend through Facebook! I’m going to break down each part of my trip through the photos below. 3. Ghirardelli restaurant that was attached to the hotel. Talk about dangerous! The smell of the store was amazing!!! They handed out Pumpkin Spice Chocolate. Yum! 4. Me at Ghirardelli store. Look at all the chocolate! 5. Belden Lane – I know it’s a weird looking alley, but past the garbage dump, there were some fabulous restaurants hidden in there. It’s one of San Francisco’s hidden gems. Marlene knew about it, so we searched and found it! 6. Darn Good Food – This is the restaurant that we ate lunch ate. The price was pretty good and the servings were huge. Marlene and I split a basic salad and a turkey with honey mustard dressing sandwich. 7. Our sandwich with a side salad and little potatoes. 8. 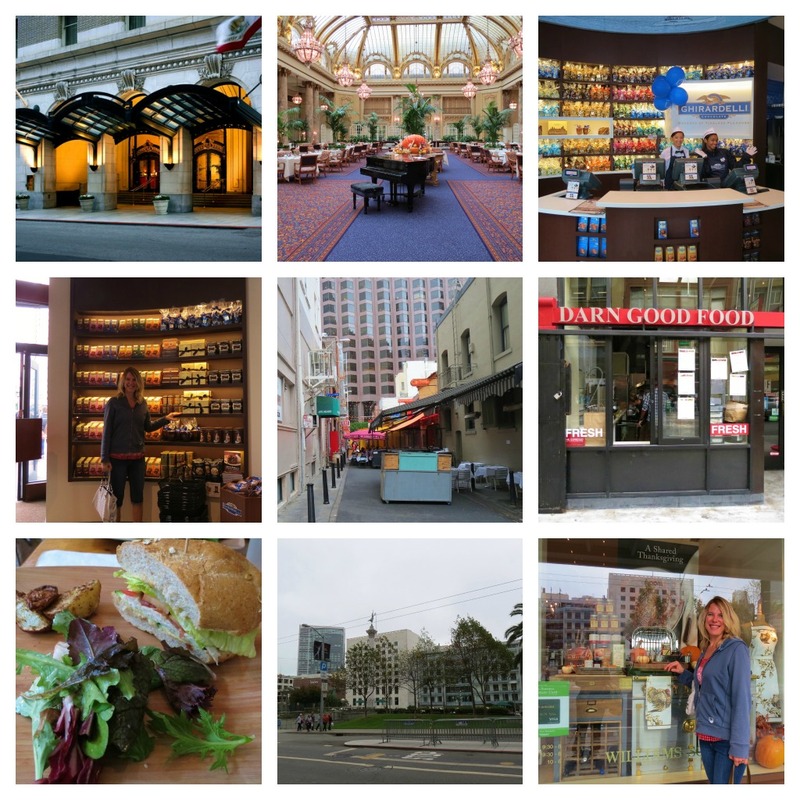 Union Square – After lunch we headed to the Sir Francis Drake hotel to check in with Foodbuzz and to get our swag bag. The hotel is located in Union Square. 9. Williams and Sonoma – This me standing in the front of the store, wishing I could go on a major shopping spree!!! Just look at my hair! Man, fog does not do it any justice!! After we got our swag bags we decided to head to Macy’s for a makeover for our big night on the town. That was pretty cool, even though I got suckered into buying some makeup!! Here are the goodies that we got in our swag bag! 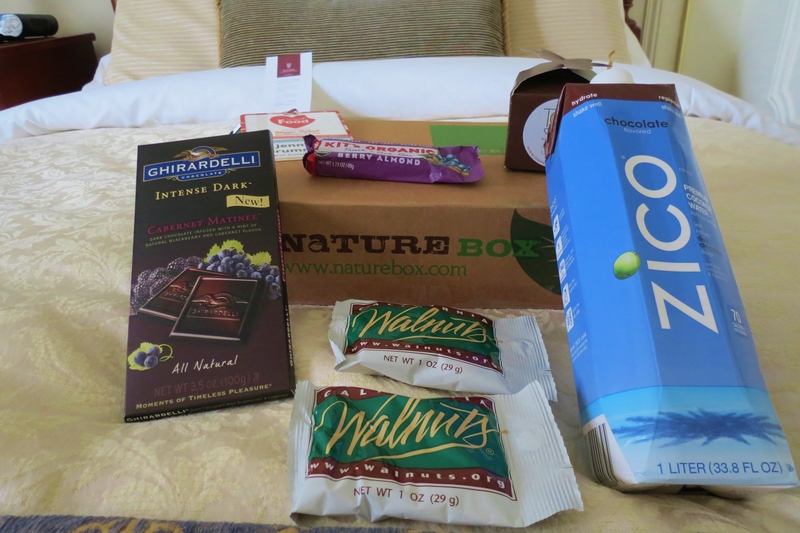 I love the Nature Box! It was full of nuts, granola, dried apricots and more. It was one of my favorite goodies that I got! For the first night we had a cocktail party at the Starlight Lounge which is located at the top of the Sir Francis Drake Hotel. I had a total blast! Here is a description of each photo. 1. Me just before the we left for the event. 3. The menu of the appetizers at the event. They had a wonderful Spiked Watermelon which was made with Luxardo, Pickled Fresno Chili’s, Lime-Salt and Basil Oh my gosh I could of ate a whole tray of them!! 7. The Unicorn restaurant – After the cocktail party we went to the Unicorn Restaurant for dinner. The Unicorn is a Asian restaurant location is on Pine Street. It was pretty cool in there. 9. Anne from Webicurean, Me, Shannon from Killer Bunnies, Christi from Mom, What’s for Dinner? and Marlene from Nosh My Way. I stole this picture from Christi, hope she doesn’t mind. 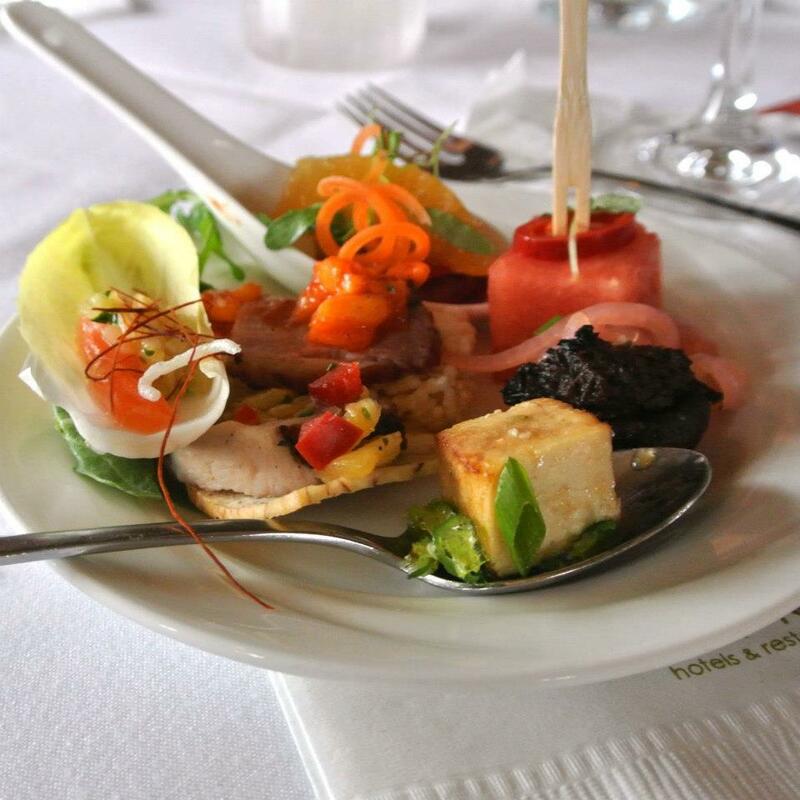 But she got a picture of all the appetizers from the Starlight Lounge and she did a great job photographing them. 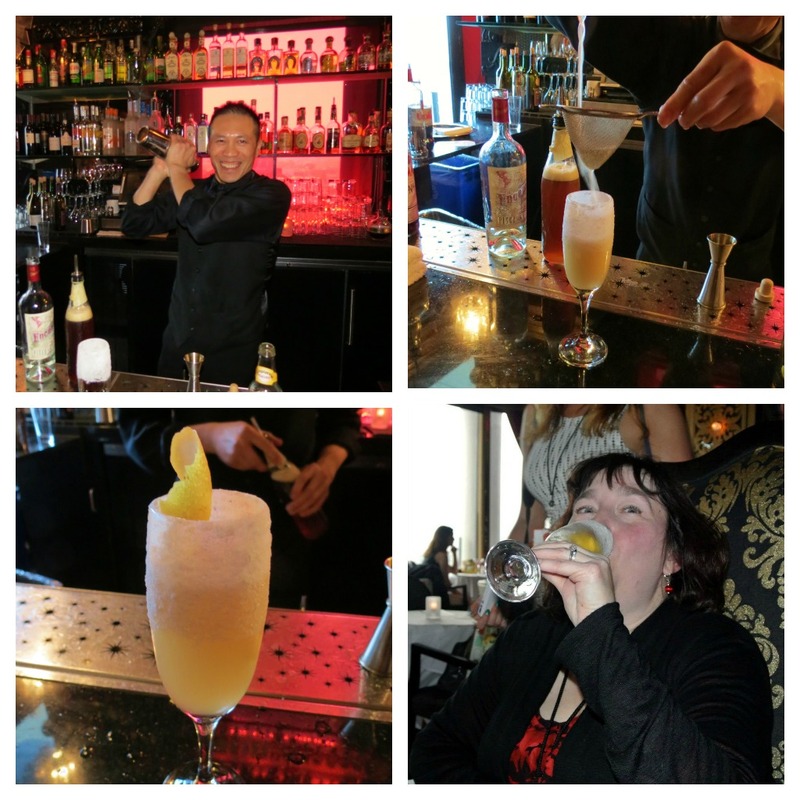 Oh, I have to share with you a photo of the bar tender from the Starlight Lounge making this gorgeous drink. That’s Wendy from Weekend Gourmet drinking it! She let me have a sip and it was so good! The sugared rim was just beautiful and a perfect touch! 7. Valerie from Valerie’s Kitchen and her Husband Paul. I was so happy to meet Valerie. I have been a fan of her blog for a long time! 8. Joanne and her group! Here are some pictures of the food we ordered. I honestly don’t know what everyone ordered I just know I had the filet mignon (picture #1) with green beans, which was delicious. Oh and in the middle is Marlene and Christi. I want to thank Daily Food Buzz for having this event. 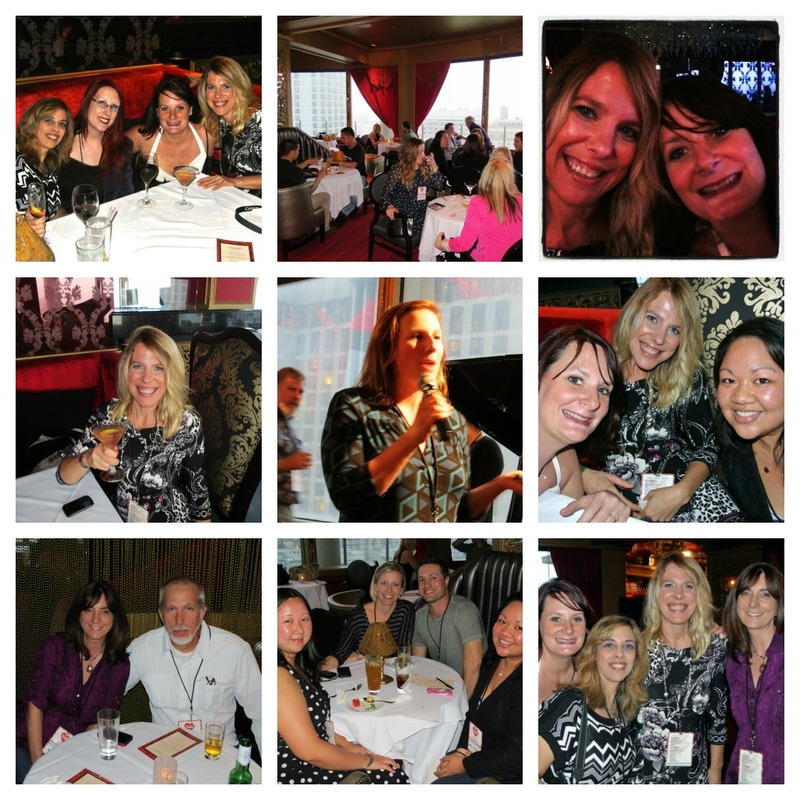 I had so much fun and I loved that I got to meet my fellow bloggers. Nothing like a group of people getting together that have all the same thing in common, FOOD!!! I’ll recap the rest of the event later this week!! This weekend whipped me out and I am ready for bed! Oh it will be so nice to go to sleep in my own bed! Here is a list of the peeps that got stuck with me over the weekend. Aww I’m so glad you had fun! I went last year and you’re right…there was a lot of noshing but not very much real sit-down eating…which made it harder to keep track of how much I ate! 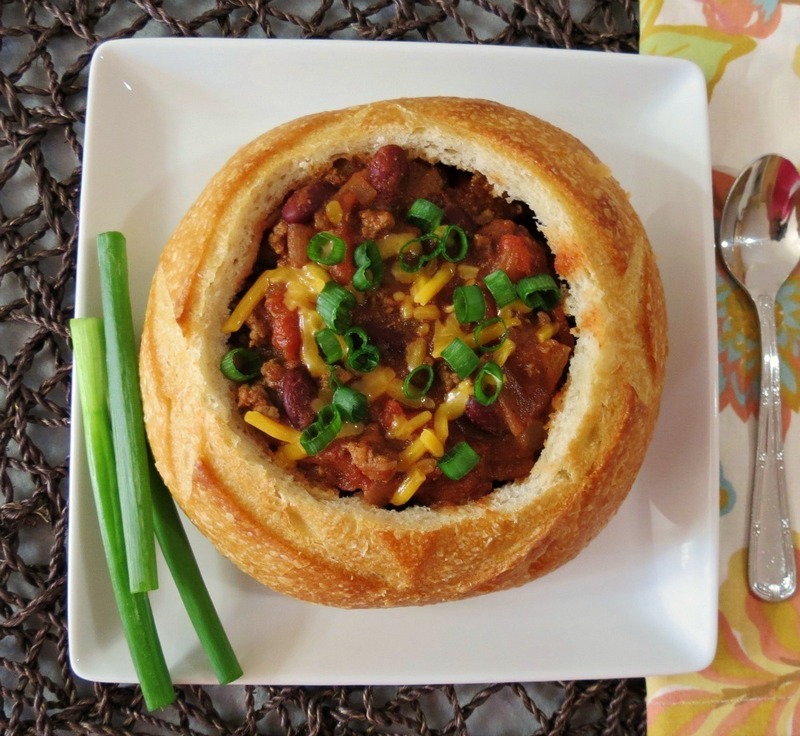 I can definitely see craving this chili when you got home…sounds amazing! I wish you could of gone this year!! 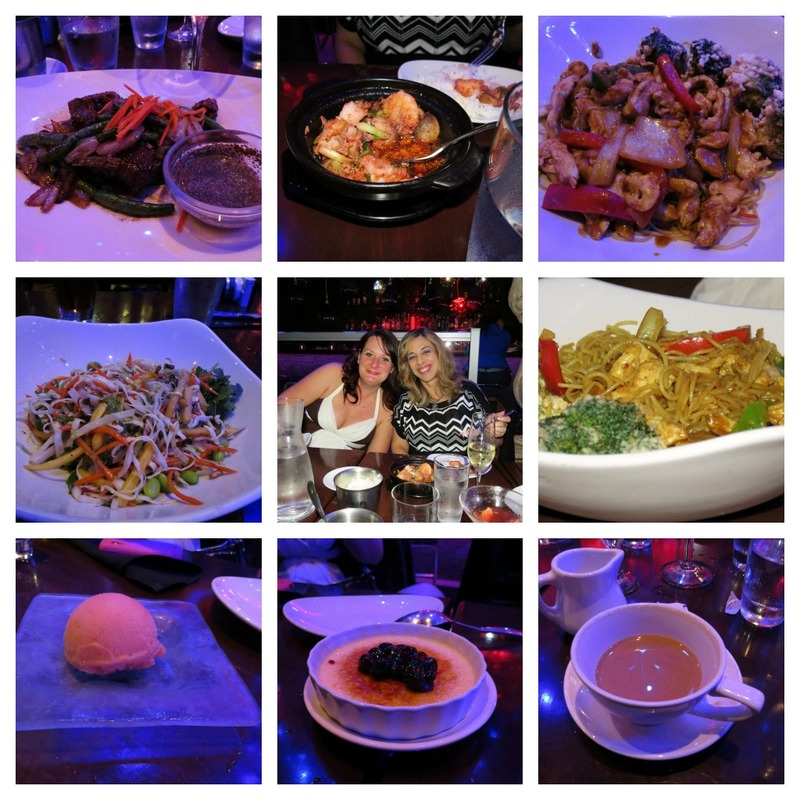 The food was incredible, but there was so much of it!! I actually felt ill from eating so much!! But would I do it again? Yup!! ooo, that looks like it was SO MUCH FUN! the food looks great, and food STORES are awesome too 🙂 just out of curiosity…is “Wally” short for anything? Waldo, Walter, etc? Your chili looks delicious, I’m so wanting a bowl for lunch! But your weekend looks amazing! How fun to meet all these virtual friends in person! You look so pretty and like you’re having so much fun! Love all your photos, thanks for sharing. It looks like you had a great time. I love San Francisco, what a great city. 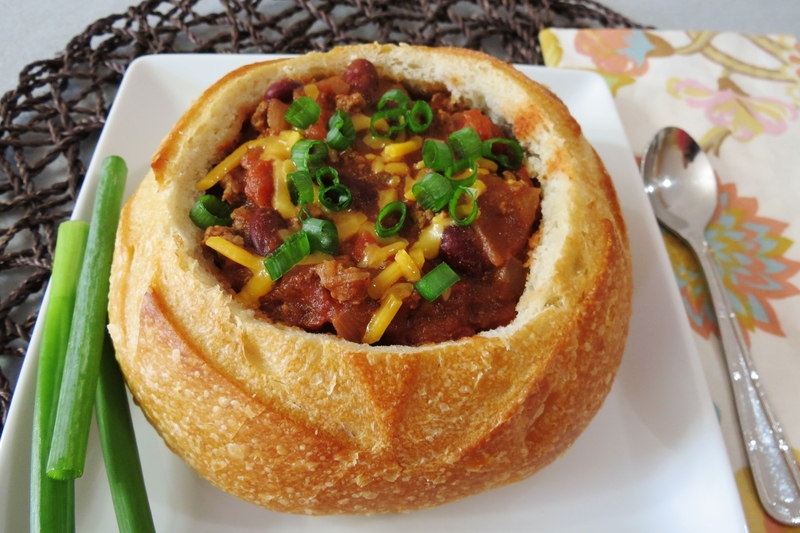 The chili looks so hearty and tummy warming, of course it had to be served in a sour dough bowl! Is there any other way to serve chili? lol, However my Husband not a fan of sourdough, he had to have rye bread with his chili. I loved reading this post! I miss it already, but like you, I am wiped out! Beautiful chili bowl! i am jealous of the bread! The bread is so good, that’s one thing I love about SF! I am so wiped out, I’m actually ready for bed now! What a fun weekend! The food and the friends all look amazing. And the chili, so perfect for this cooler weather! I have to try the chili bowl…never had chili before (I know I have had a deprived life lol). The whole blog event looks like so much fun! It would be awesome to be invited to something like that! What, never had Chili!! You have to make it!! You must and then come back and tell me what you think!! 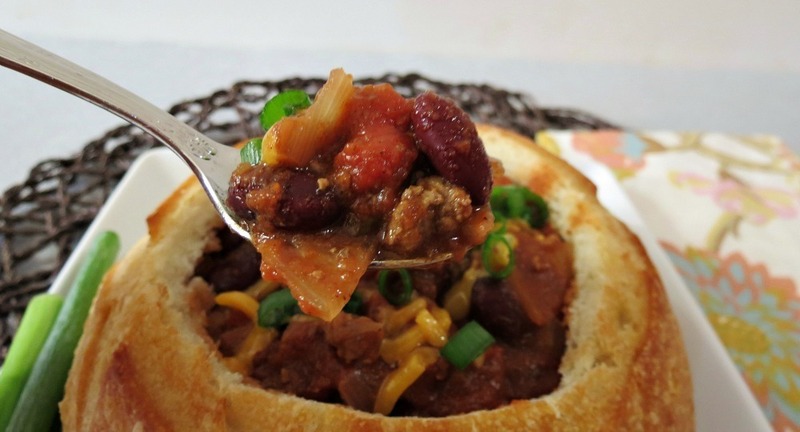 Chili is a fall/winter staple meal in our house!! 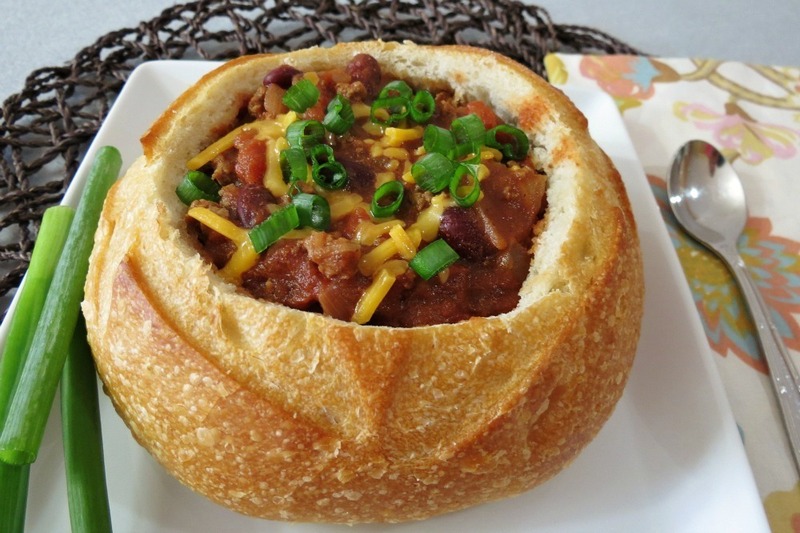 It looks like you had a great weekend 🙂 That chili bread bowl is calling my name! Wow very impressive! Thank you, I’ll let me Husband know!! Your compliment will put a big smile on his face!! The conference looks like it was a blast! I enjoyed seeing all of your photos! The chili looks amazing too! Thanks Stephanie! I had a lot of fun this weekend! I still need to recap the rest of the event! I’m getting here SO late but wanted to tell you how much I enjoyed having the chance to meet you! 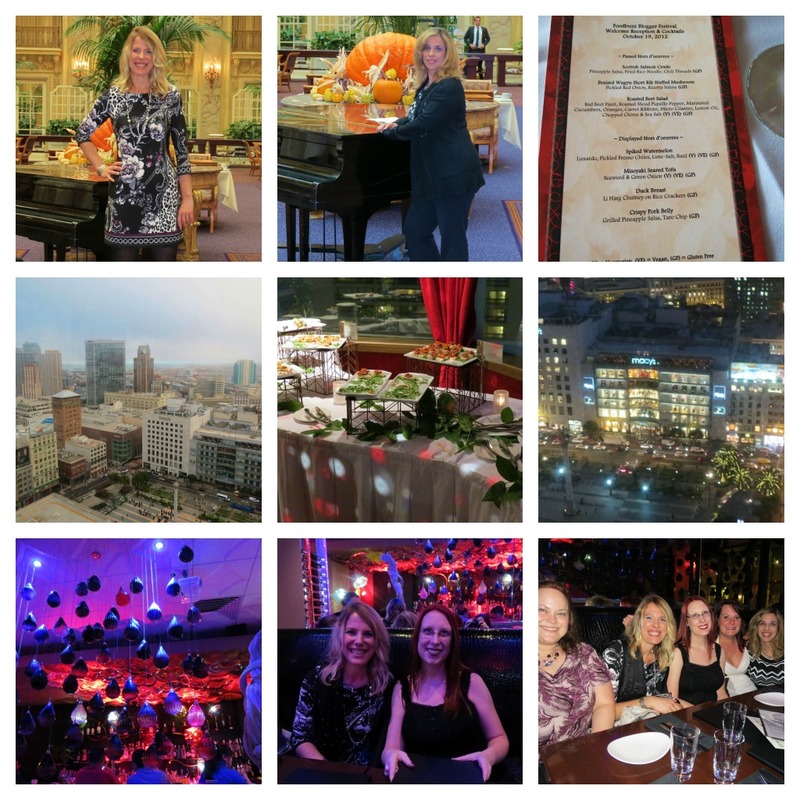 We had a great time at the event and how gorgeous was the venue for the gala dinner? Incredible. The chili looks so good Jennifer. Perfect for a chilly fall day.